Last night, like most nights of late, I swayed the time away in the hammock my friend has strung-up just outside his ocean view window. It was well past the military imposed curfew and yet ungentle party beats were thumping across Chaweng Bay. I was watching BBC International. You may have heard that major news stations have been blocked, but that like most rumors floating about is wildly exaggerated. BBC International has had this young guy on scene since the military coup began. Every day the silver haired tan people in the studio pepper him with questions looking for evidence of fear and violence, and everyday the young guy shrugs his shoulders and tries to find new ways to explain that nobody but nobody is all that worried about it. The hammock swung and the BBC dude went scrounging for interviews on Khao San Road (the backpacker district of Bangkok). He tried to hit a Pad Thai vendor with the tough stuff, but she just smiled sweetly and explained that she was happy the military had taken over, because now the problems in the city will stop. He wasn't sure what to do with that, so he found some British tourists and asked if they were considering cutting their holiday short. They laughed at him. You may have seen a video clip of a few dozen people pushing against the soldiers plastic shields and waving anti-coup banners. The reason you keep seeing that same clip on repeat is because that's all they've got. 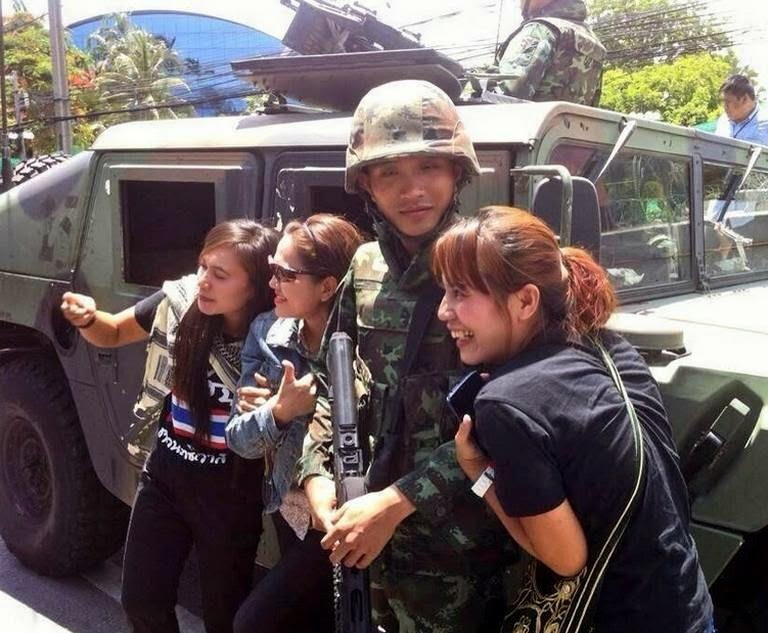 I've been on Koh Samui the whole time, but I know people in Bangkok and the most enduring scene of the military coup so far is giggling girls taking selfies with handsome soldiers. BUT IT"S A MILITARY COUP!! We don't have a term that accurately describes what is currently happening in Thailand. Military coups are part of the political cycle here. While wildly undemocratic, they are the way Thai's have reset the political landscape since the 1930's. It would be easy to see the current situation as a powder-keg, and maybe it is, but the wick is made of orchids. "Military led stewardship to oversee Thai election and constitution reform." The military will hand the government back to the people. There will be a new constitution and new elections. And none of this will happen as quickly as the West would like. If elections were held tomorrow the ousted prime minister would win again, and the civil strife that has plagued the country for the last decade would continue burning. It is a messy political divide, but not overly complicated. In Thai society the totem of power is Buddha, the king and down and away the prime minister. The prime minister is a democratically replaceable entity whose name can never challenge that of the king. Since 2005 the Shinawatra family has been shaking that structure of reverence. Thaksin Shinwatra build an incredible base of power in the North by appealing to the poor majority and by creating controversial initiatives aimed at improving their way of life. His opponents claim that he bought votes and that his initiatives have been crippling to the economy. Thaksin was exiled, but when the Thai people got the chance to vote again his sister Yingluck won in a landslide. No private family has ever attained this level of power in Thai politics. The simple answer is to vote them out. Do the work, campaign, raise awareness for other parties, use the system to fix the system. But, here is where things get complicated. The king is old. He is the longest reigning monarch in the world and seen as a near deity here in Thailand. His son is mortal and then some. No one wants succession to happen, and yet eventually it must. The transfer of eras will not be smooth and thus the totem of reverence must be unshakable. That sweetly smiling Pad Thai vendor in Bangkok expressed the sentiments of many Thai people. Especially those outside of the Shinawatra power base. They wanted a military coup, because a coup means a political reset long past due. I don't know how or when the coup will end, but here is what I predict. The Shinawatra family will be barred from participating in future elections. The new constitution will look suspiciously like the old constitution. And the military will maintain its presence in Bangkok until the new prime minister is in office and life is humming along nicely. 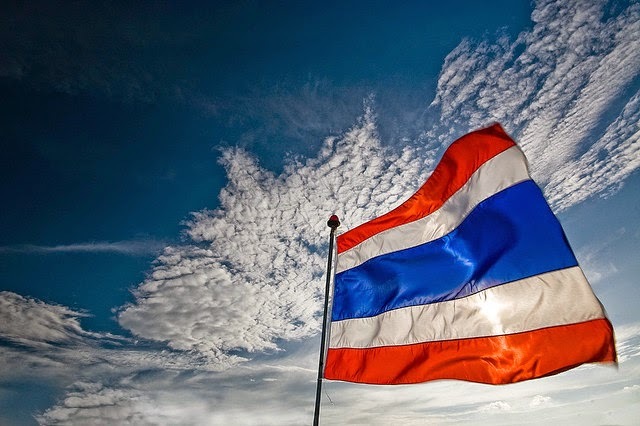 The totem of reverence is vitally important to the Thai people and will continue to be in the future--because Buddha is immovable and because, I very much doubt the son can erase the greatness of the father. Post-coup there will be a period of peace, but there will also be unhealed wounds. Even with the Shinawatra family removed from the equation the political desires of the city elite and the rural poor are far apart and fixed. Peace will be tested. And when it is, I hope that the Thai people can trust the reverence in their hearts and allow change to come via the democratic system. A political philosophy that allows the military to take an occasional machine-gun broom to the system is a dangerous gamble no matter how much history says otherwise. After all, even a wick of orchids can wither and ignite.